Do you turn to food for comfort when life is not quite going to plan? You are not alone; many people suffer from stress eating. The good news is that this erroneous program can be quickly removed with hypnosis. You are not broken! All self-limiting beliefs, phobias and bad habits are simply bad programs buried in the unconscious area of the mind. Willpower is entirely ineffective in dealing with these issues because you are prevented from accessing the source of the problem. 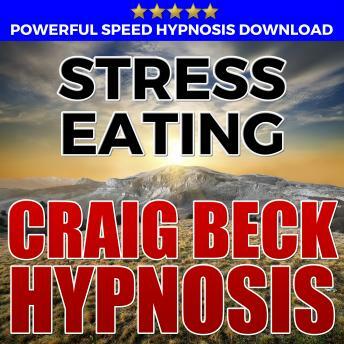 Craig Beck is a master hypnotist, a world-renowned respected timeline therapist and NLP master practitioner. Craig understands what makes people tick and more importantly how to access and remove the erroneous programs in the subconscious mind that cause us problems in everyday life. Designed to quickly help you improve your ability to cope with stressful situations without resorting to food; Use this powerful and proven MP3 hypnosis download to dramatically decrease stress eating. -	Rapidly reduce the urge to binge on food. -	A highly effective solution to long term emotional eating issues. This kindle book includes a free MP3 download link for the accompanying hypnosis track.